choose "file" in the top left corner and select "download". I know it, it's been a while since we've had a freebie grace this little ole' blog so I thought it was about time. I've been seeing this cute little phrase all over the internet this week so I felt it appropriate to create my little take on a desktop download for you pretties! There's something so chic about the gold and black combo and the saying just adds that perfect amount of spice. I hope you love and be sure to spread the download with all your lovelies too! Use #kinchdesigns on twitter and instagram when sharing and feel free to tag me @aubreykinch! Love it!! Will be downloading and sharing the love! ADORABLE. As always :) Can't wait to one day have you design my blog! Just in the saving process (broke college student here) lol. good heavens i love your freebies.all.the.time! 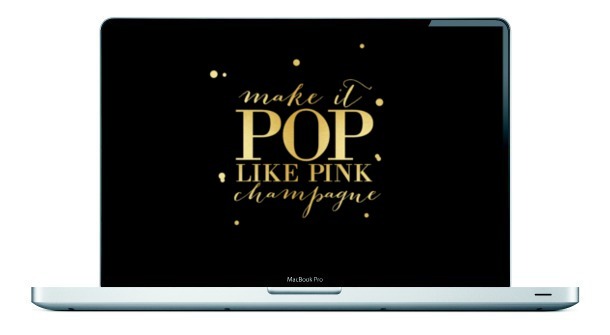 this little champagne nod is just too perfect for friday/weekend! !